It's that "pumpkin spice" time of the year. It seems like everywhere you turn, they're adding it to something. I've never tried one of those famous Pumpkin Spice Lattes that are all the rage but I do have a fondness for Pumpkin Pie frozen yogurt. It's like having a frozen slice of pie without the crust....yum! 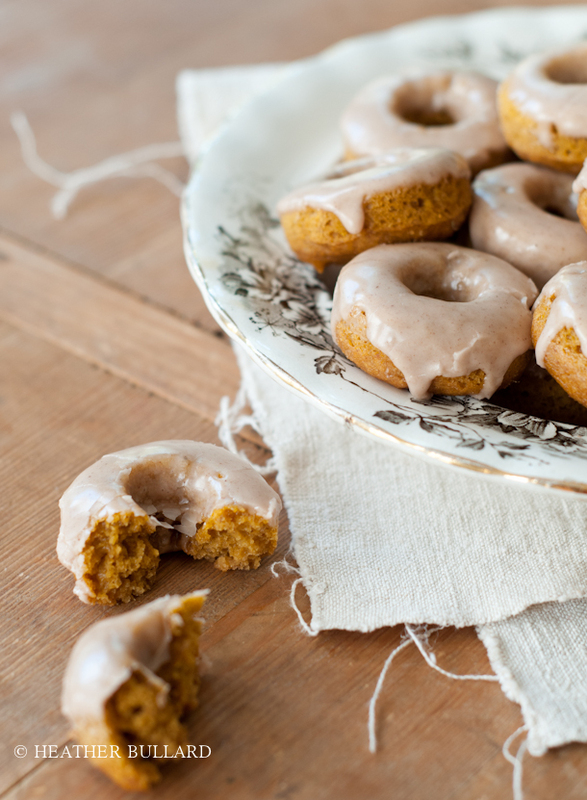 I also enjoy a slice of pumpkin bread on occasion which got me to thinking, instead of making bread this year...what about mini baked donuts? So I set about creating this recipe of a baked version, and because they're bite size, I ramped up the spices to add more punch in every little bite. I'll warn you...they're quite addicting but since they're little, you can indulge practically guilt-free. Spray a mini donut pan with cooking spray. Blend together the eggs, sugars, vanilla, applesauce, and pumpkin puree. In a separate bowl, combine all the remaining dry ingredients. Slowly add the dry ingredients to the wet ingredients and combine until smooth. Spoon into prepared donut pan, filling only 1/2 way full. Wipe edges and centers of the pan with a wet paper towel. This will help prevent sticking. Bake for 9-11 minutes or until done. Place on wire rack to cool, then dip the top of each donut into glaze. Let set before serving. If you prefer a lightly sweet and crunchy topping, as opposed to the glazed variety, try coating them in cinnamon sugar when they're still warm just from the oven. I like to do half with the cider glaze and half sugar coated. Either way...they're delicious!